Much to my surprise, I found a Maggi restaurant while strolling through a hyper-modern shopping mall in downtown Leipzig, Germany. 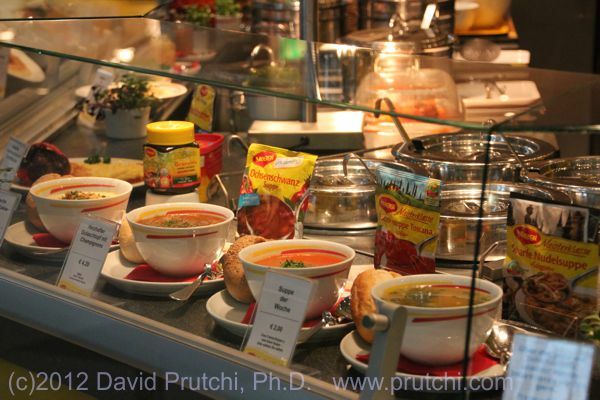 Apparently, Germans really like freshly reconstituted Maggi soups! Googling about it, I found that the first Maggi Cooking Club started in Frankfurt in 1996, and the one in Leipzig has been around since 2002. They now have these Maggi “Cook Studios” in quite a few cities around Germany. 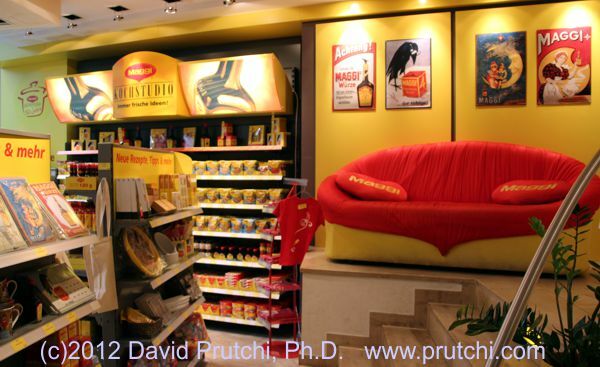 “The original company came into existence in 1872 in Switzerland, when Julius Maggi took over his father’s mill. He quickly became a pioneer of industrial food production, aiming to improve the nutritional intake of worker families. Maggi was the first to bring protein-rich legume meal to the market, and followed up with a ready-made soup based on legume meal in 1886. In 1897, Julius Maggi founded the company Maggi GmbH in the German town of Singen where it is still established today. In parts of Europe, Mexico, Malaysia, Brunei, German-speaking countries and the Netherlands, Czech Republic, Slovenia, Slovakia, Poland and France, “Maggi” is still synonymous with the brand’s “Maggi-Würze” (Maggi seasoning sauce), a dark, hydrolysed vegetable protein based sauce which is very similar to East Asian soy sauce except for that it does not actually contain soy. It was introduced in 1886, as a cheap substitute for meat extract. 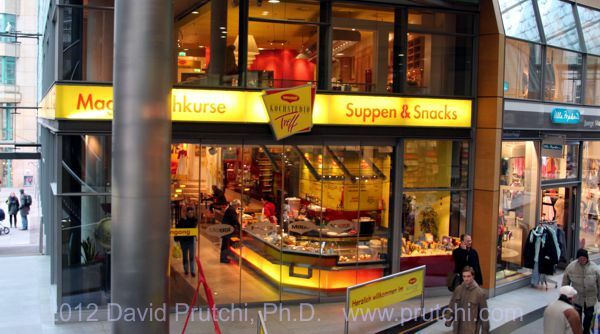 It has since become a well-known part of everyday culinary culture in Switzerland, Austria and especially in Germany. It is also well-known in Poland and the Netherlands. I am intrested to know more about your maggi cook studio.I would like to say that in India people are very found of maggi but we do not have a cook studio like the one shown above.waiting to hear from your end.